There has always been a need to cross over the main channel of the Los Angeles Harbor, even in the early 1870’s, when the first ferry service consisted of a rowboat that made the trip to Terminal Island only as passengers were available. Ferry service was the only means of transport for decades. From 1937 until 1957, various proposals were considered regarding construction of a tube tunnel connecting the Harbor and Long Beach freeways. Engineers concluded that a four-lane bridge could be built for slightly more than the two-lane tube. 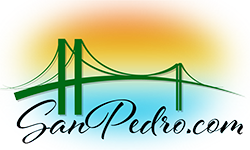 Completed in 1963, “San Pedro’s Golden Gate” was the first bridge of its kind to be constructed on pilings. Construction required 92,000 tons of Portland cement, 13,000 tons of lightweight concrete, 14,100 tons of steel and 1,270 tons of suspension cable. It is designed to withstand winds of 90 miles per hour, double that required by code. The overall length of the bridge is 6,050 feet, with a main suspension span of 1,500 feet and 500-foot spans on either side. The towers are 365 feet high. Named for one of San Pedro’s “own,” an orphan from the streets and wharves who went on to become a State Assemblyman, it was The Hon. Vincent Thomas who cut the ribbon at the dedication ceremony. 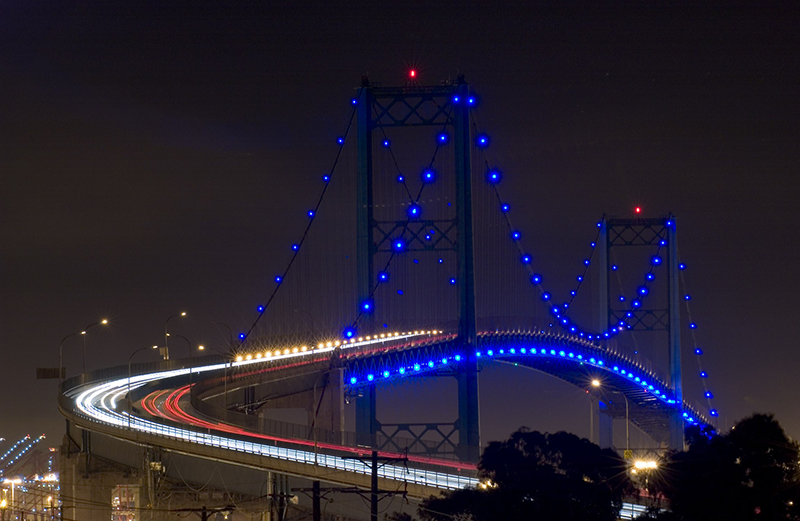 On January 30, 2005, after 17 years of planning and fundraising, the Vincent Thomas Bridge Lighting ceremony was held. The entire Harbor community rejoiced when the switch finally was flipped and a star was born. The bridge is illuminated with blue LED lights which are powered by solar panels. The solar panels feed more electricity into the grid during the day than the LED lights use at night. There are 160 lights on the bridge and it is the first combined use of solar power and LEDs in a bridge lighting installation. The lights operate from dusk to midnight in order to minimize impact on wildlife. The dramatic green bridge is designated as the official landmark welcoming visitors to Los Angeles.